After three days pretty much non-stop rain it was a nice surprise to wake up yesterday morning with sunshine streaming through the window – and the early commute across London to Stepney Green suddenly didn’t seem so bad. Yesterday morning was my first ever #techmums training course: I’d been teamed up with fellow #techmum Judith Scammell to run a one-off session on social media and online security at Stepney Green Maths & Computing College, East London. I had many burning questions: What would the mums be like? How difficult would it be to get them talking? How would we run the session without full social media access? Would anyone actually turn up? What sort of place was Stepney Green Maths & Computing College? Did they really name it Ben Johnson Road after the disgraced Canadian athlete and…most importantly…can you buy a decent skinny latte that side of Hoxton? Luckily, all my fears were laid to rest as soon as Judith and I met the friendly, smiling Ayesha (IT manager) and the fifteen mums who’d signed up for the session. The mums were keen, sharp and full of questions. Most of them had one or more teenage children and were familiar with new technology. One of the mums even told us about a new app, Telegram Messenger, which we’d never heard of (so thanks for the tip)! As we’d expected, the mums’ main concerns were around online security – especially dodgy pop-ups, and children viewing material they shouldn’t be. This was just what Judith and I had imagined – and in fact we were a little worried about starting the session with an evangelical talk about the wonders of social media. But the mums also talked about how they loved to share photos and reconnect with old friends on Facebook. And they seemed genuinely inspired and excited by the social media stories we told – from Lauren Luke becoming a hit on YouTube and setting up her own make-up empire, to Sue Black saving Bletchley Park through a humble Twitter campaign. All in all, it was a great way to spend two hours. I’m off to check my Twitter – who knows, I may have a tweet from one of the Stepney Green mums! That was their homework – mine is to download the Telegram Messenger app (obv). Today was a busy #techmums day, and a day of contradictions. 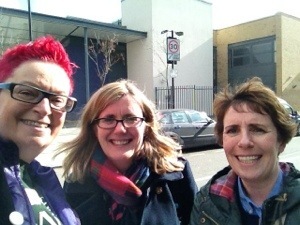 Mary and I ran our week 5 #techmums class with Bishop Challoner school mums in Tower Hamlets in the morning. We were happy to see our fab mums, but sad because it was the last class for this wonderful group. I’m going to miss seeing them every week. 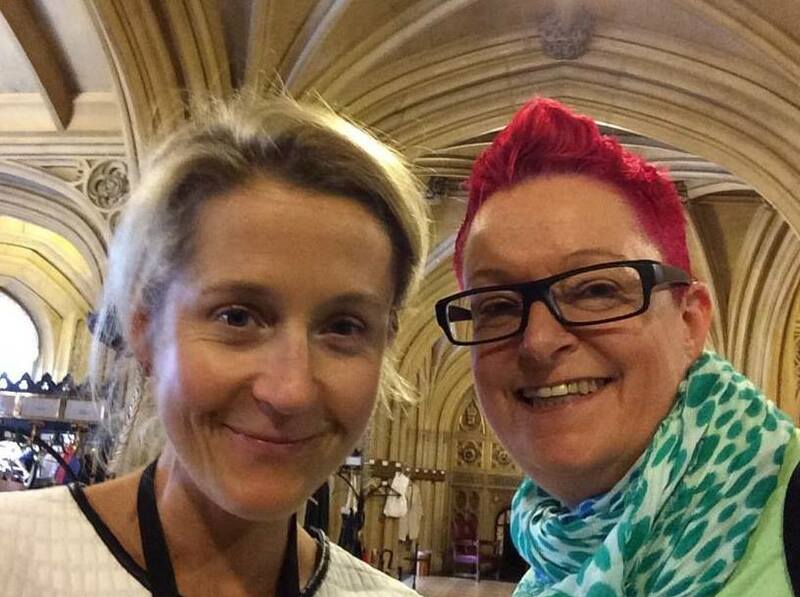 Then it was back into London and a walk from Waterloo to the House of Lords where I had a really great chat with our fab patron Baroness Martha Lane Fox about #techmums, women in tech and Bletchley Park. Such a massive contrast from morning to afternoon. The morning spent with mums in Tower Hamlets where the average life expectancy for a woman is the lowest in the UK at just 54. The afternoon spent at the House of Lords in Westminster an area where I’m sure the life expectancy is much higher. Very different, but with a common thread, women, tech and empowerment. 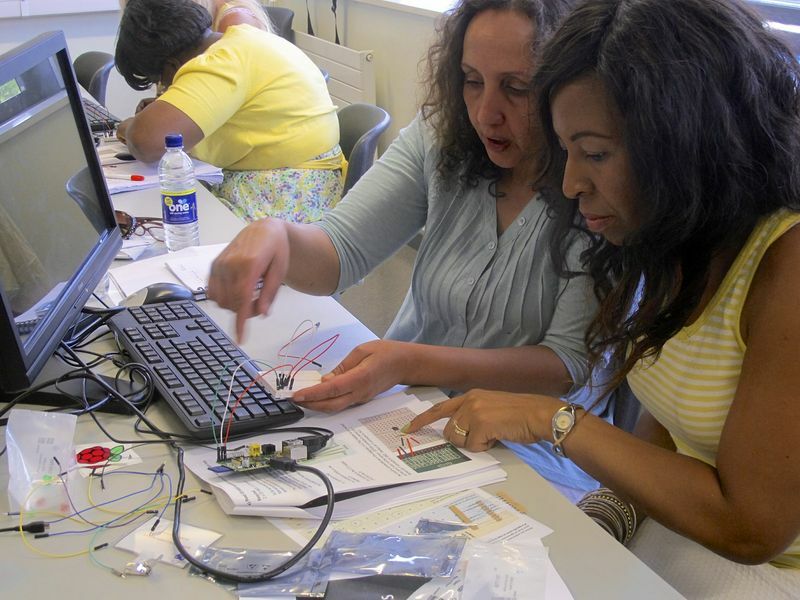 Technology, and social media in particular is bringing about a revolution for women. The amount of empowerment that I see being talked about and happening around me is very life affirming. From Beyonce’s wonderful songs, to Everywoman and Stemette’s to EverydaySexism, #techmums, Big Swinging Ovaries and Ada’s list, women are being empowered all around us. I can feel the buzz, can you? We still have a very long way to go, but we are on the way. Women are connecting together to help each other, the ripples are quite small at the moment, but they will grow bigger and bigger until, in the not too distant future we will see some massive changes occurring. I’m so excited about how technology is changing our world, and this is just the beginning…..
“What’s the use of social media?” That wasn’t a sarcastic question, that I pondered this morning, it was a real one. Sue (@Dr_Black) had sent a message from her sickbed asking if any of her friends would be able to run her social media class that morning, in East London, to local mums wanting to improve their tech skills. Given that I live 20 minutes walk from the venue (Bishop Challoner Catholic School on Commercial Road), I thought about saying yes, as I sipped my coffee, but not before I asked myself “what’s the use of social media?” and “what’s the use of social media to this group of East End mums?” Clearly, there are numerous answers to the first question and I could only guess at how these women might answer the second. But what did strike me, a few minutes after saying: “yes, I’ll do it, Sue”, is that they are all already clued up on social networks. These women make all sorts of magic happen in their homes, at work and in their local community because, by enlarge, that’s what women all over the world do – they keep it all going. With such short notice, I started the class with this in mind and gave the example of how my siblings and I had bought my mum a computer and got her on Facebook (she’s in her 80s). We all thought, ignorantly, that mum would struggle to grasp social media. How daft of us; mum had grown up in Liverpool in the 1930s, one of a large Irish family. She’d watched her mum make things work by negotiating, bartering, helping, charming, sharing and discovering all she needed through her daily chats across the back yard washing lines, or in the street, the church or at the corner shop. So had my mum when she brought up me and my four siblings and so were all of these women – on a daily basis. Mum grasped social media, it was innate and all of the women in front of me grasped it too. We moved on to how they might use social media to gather more voices to join their causes, or help in their community. Most used Facebook a little and one had tried Twitter. Ann Marie (one of the mums) brought up the breast cancer awareness drive on Facebook and how women were taking make-up free ‘selfies’ to promote the cause. Suddenly the room buzzed with ideas of other causes and how using social media might help them bring issues and ideas to the fore. We all played a little, taking an Ellen DeGeneres Oscar selfie and Tweeting it. The power of this network was quickly revealed when the image was re-Tweeted eight or so times in under a minute, to an audience exceeding thousands. The concept of social media was straightforward to everyone in the room, the only thing they really lacked was some of the language and a little of the working detail; what’s that sign (hashtag), how is it used, what are characters, what’s a direct message and so on. The hour was too short and probably taught me much more than it taught the participants: more often than not, the barrier to entry is feeling that we don’t understand, when in actual fact we do, it’s just that the language is a little different. Today was my first delivery of the #techmums course to 13 mums. What a great morning! I have to say that I went in not really knowing what to expect. The mums arrived looking a bit apprehensive, and I am guessing they were feeling much the same way as me. We needn’t have worried. As the tea and coffee was poured everyone started to relax. Sue gave an uplifting intro and we were off setting up Google accounts. It was good to see how keen everyone was to get started. By the end of the session the atmosphere was buzzing. No matter what their level each mum had accomplished something and learnt something new. The smiles and shouts of “see you next week” as the mums were leaving was good to see. Bring on the next module. #techmums is all about giving mums the opportunity to take part in the digital revolution. In 10 hours of intensive, hands on workshops we take mums, who can be disempowered around technology, from being scared of the keyboard to being tech savvy. Our pilot has shown that we can make a dramatic difference to women’s self esteem and confidence with tech, affecting not just them but their whole family. This campaign seeks funding to give 140 mums in the poorest area of the UK the chance to become a #techmum. We are currently rolling out #techmums in Tower Hamlets and in Surrey, we would love to hear from you if you work at a school and would like to run #techmums or if you are a mum and would like to be a #techmum. 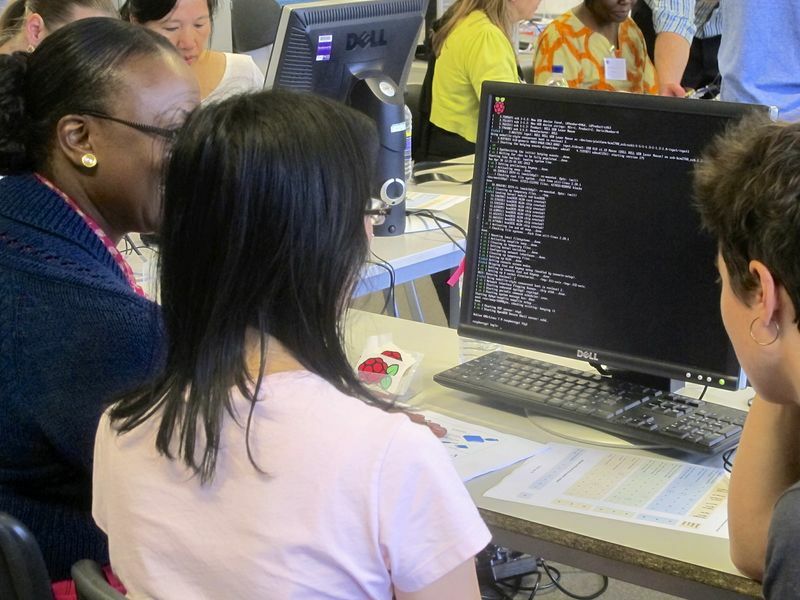 If you are comfortable with computers and tech savvy there are many opportunities for you to take that further. You could set up your own business, take a course online, you can interact with the world in whatever way you choose. But, what if you are afraid of the keyboard? What if you believe that Facebook ruins your kids’ lives and you don’t know how to stop it? What if you need to send emails at work, but you don’t know how to, and are embarrassed to tell anyone? 25 years ago our Founder Dr Sue Black was a single parent with 3 children living in poverty. Through tech education Sue was able to bring her family out of poverty, earn a decent living and create a better future for them all. She knows first hand what a difference education and confidence with technology can make and now wants to give that opportunity to other mums. We are Savvify: Emma, Sue and Clare. Three mums with nine kids between us who think mums sometimes get left behind when it comes to tech. We have created #techmums to change that. 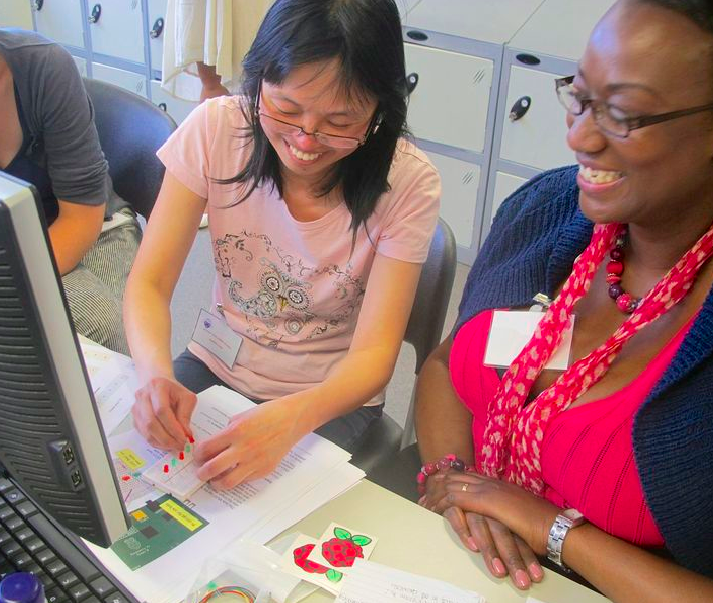 #techmums is a short, hands on course that introduces mums to app design, social media, Python coding on Raspberry Pi’s and much more. We believe that confidence with technology can change lives for the better. Mums are the cornerstone of the family, so if we can change mums’ confidence we can change the whole families’ outlook and prospects. We want to give everyone the opportunity they deserve to take part in the digital revolution. 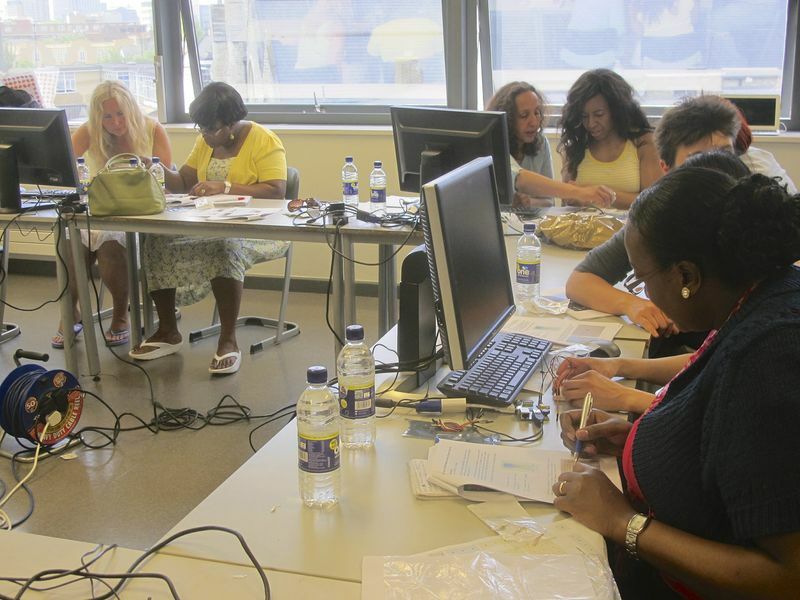 We recently ran a very successful #techmums pilot. In just 10 hours we took mums from being afraid of the keyboard and scared of what their kids are doing on Facebook to being confident with tech. Through intensive hands on workshops we worked with mums to give them confidence and help them to see and understand the opportunities that are out there for themselves and their families. 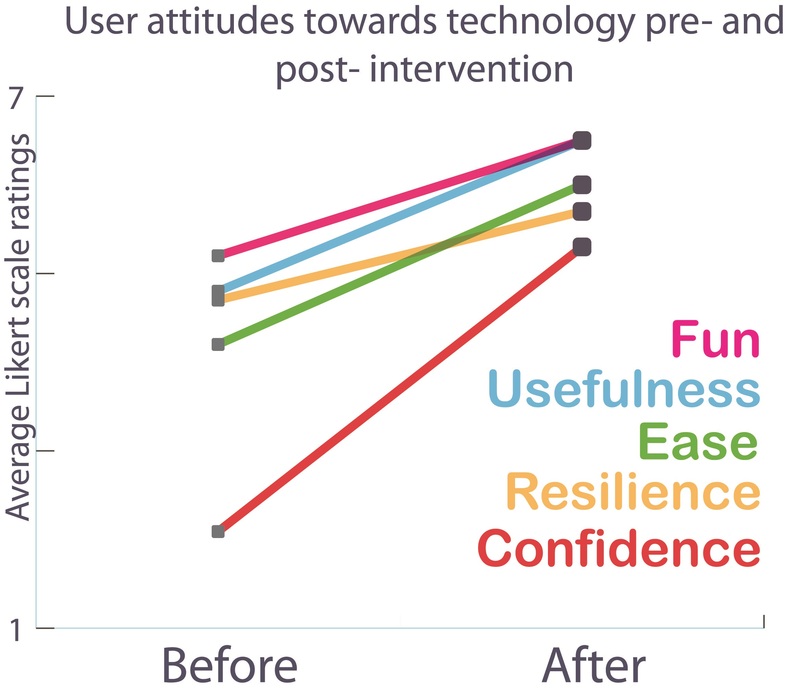 Dr Lela Koulouri, a researcher from Brunel University measured our #techmums attitude towards technology throughout our pilot, the results are below. Just look at that massive increase in confidence with technology over the 5 weeks. Lela also found that mums’ overall confidence in themselves increased too. This was backed up by Nick Soar, the Headmaster at Bishop Challoner where we held our pilot. He said that not only did the mums’ confidence improve, but he also saw a difference in their children too. Great stuff!! 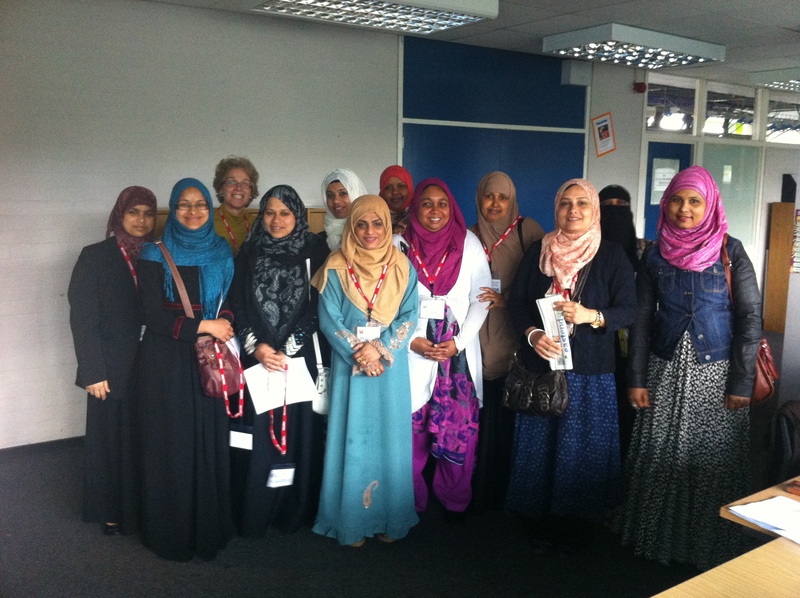 We are going to run #techmums across several schools in Tower Hamlets and Surrey. We chose Tower Hamlets because it is the most deprived borough in the UK, it has the highest percentage of free school meals in Great Britain. 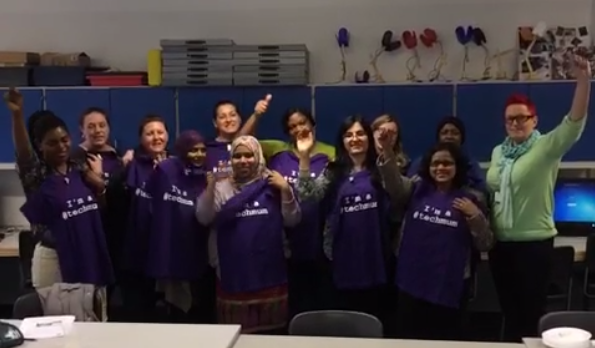 Our plan is to roll #techmums out across Tower Hamlets, Surrey and then London. After that we will be working hard to get #techmums rolled out across the UK and then the world! Want to join the #techmums revolution? #techmums has already made an impact, as you can tell in our video above. Ahmina is no longer scared of the keyboard, Chyna has got over her fears of tech and is really enjoying it, several of our #techmums were really worried about staying safe online, they are no longer afraid. Knowledge is power. #techmums is important to individuals, but it is also important to society, to business and the economy. The more people that are tech savvy, that understand the opportunities that are available both to them and to their families, the more our society as a whole will start to embrace and take part in the digital revolution. The UK was instrumental in the industrial revolution due to our great innovation, invention and creativity. Let’s make sure that we are instrumental in the digital revolution too. 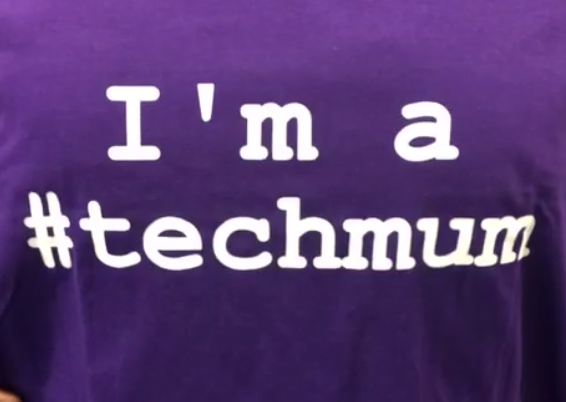 #techmums is just the start…. Please tell everyone that you think could be interested in #techmums about us. We plan to take #techmums across the UK and then the world, but we can only do that with your help. We want mums, schools and potential trainers who are interested in taking part to sign up on the#techmums site so that we can see where there is interest and start putting together a plan and the infrastructure to make the UK and then the world #techmum friendly. 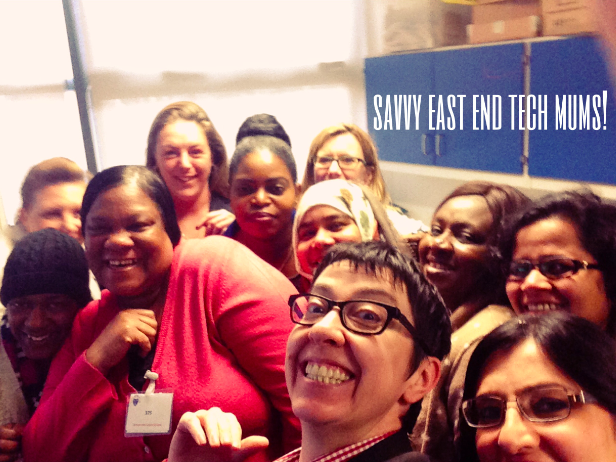 Today Tower Hamlets, tomorrow the world….. Go #team #techmums!! The #techmums course at ACL has completely changed my life!